Mrs. Valerie Beattie (right) and Dr. David Hume (left) with the immediate descendants of General Steele who attended Saturday's ceremony. Over 20 members of the family travelled to the village for the interment of the ashes of Rachel Stuart Caldwell, daughter of General Sir James Stuart Steele. The ashes of the daughter of Ballycarry general Sir James Steele were interred in the village last Saturday morning, with members of the family from Australia, England and Northern Ireland present. A short service at Templecorran cemetery was conducted by Rev. Mike McCann of St. John’s Parish Church prior to the commital of the ashes of Rachel Stuart Caldwell, who had passed away at her home in the south of England. Family members revealed that it had been her last wish to have her ashes interred with those of her parents General and Lady Steele in the family plot at Ballycarrry. Mrs. Caldwell took a great interest in community events in the village and was one of the benefactors of the Steele Trust Fund, which provides youth bursaries for local young people. On Saturday the flag at Ballycarry community centre was flown at half mast as a sign of respect. The chairman of the Trust, Dr. David Hume, and chairperson of Ballycarry & District Community Association, Mrs. Valerie Beattie, were present at the short ceremony by invitation of the family. Dr. Hume said that Mrs. Caldwell had been a lovely person who had always been keen to hear about the work of the Trust Fund and the community group generally. “Rachel Caldwell was a very generous supporter of the bursary fund and was always interested in its work. 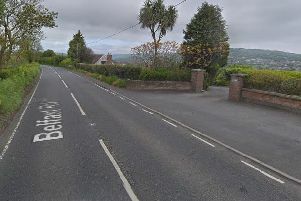 She saw Ballycarry as a spiritual home and it is fitting that her ashes have been laid to rest in the village,” he said.